Here comes the time, when everyone dressing up in scary costumes and frighten their neighbors. The LoL also participates in the worldwide celebration, and this time developers released three new skins, give the opportunity to buy all the previous skins from the Tales From The Rift series and also some other Legacy skins. And I bring good news for those of you who loved the last year’s event – Doom Bots of Doom, The Teemoing. Team up with your friend or random allies to overcome the wicked bots, who trying to summon the pure evil into the world of the LoL – The Devil Teemo himself. This is a common 5 vs 5 game mode with bots at the first glance, but if you dig deeper you will find out that enemies have much more HP than usual, and in the late game they will gather up to perform a dark summoning ritual. From this time you will be embraced by the horror itself, but together you will be able to defeat the Devil Teemo and bring light back. For more detailed review you could check my past article about Harrowing – LoL 2016 Halloween event. 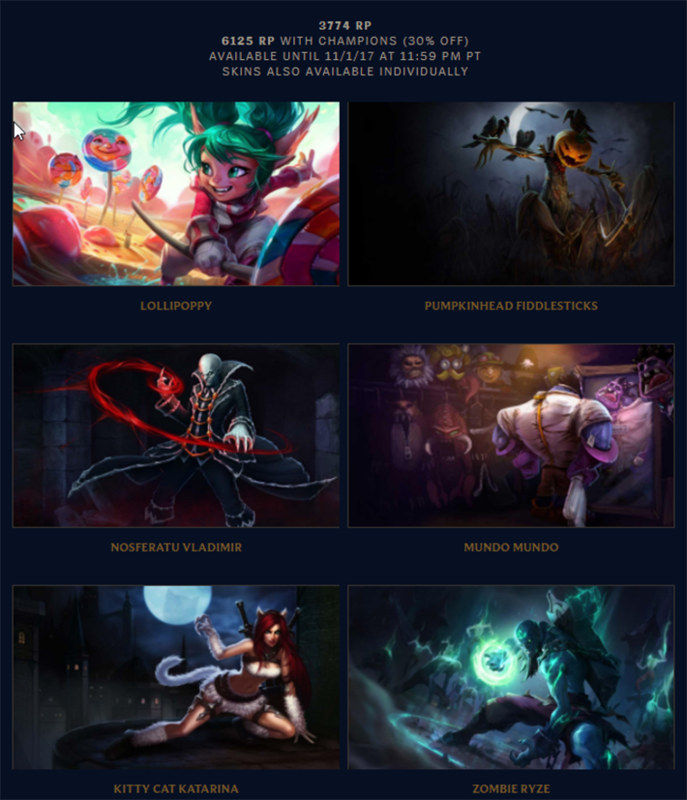 If you dreamed the whole year about buying some of the old League of Legend legacy skins, then I want to tell you a good news, until 11.1.2017 you can buy next legacy skins and even the whole bundles. These bundles do not share the same theme in most cases, and I assume they grouped together randomly. 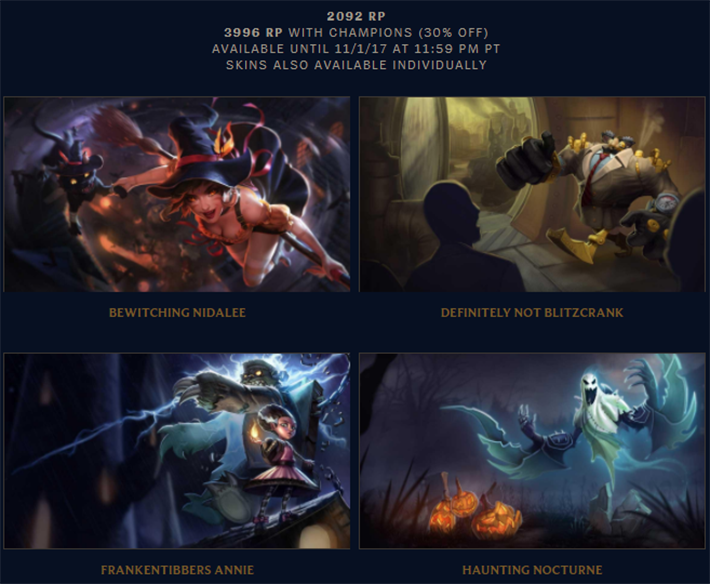 This bundle is available for 3774 RP, but only if you want skins alone, in another case, you will need to pay 6125 RP (30% OFF) – champions included. Super Supernatural Bundle is available until 1st November 2017. 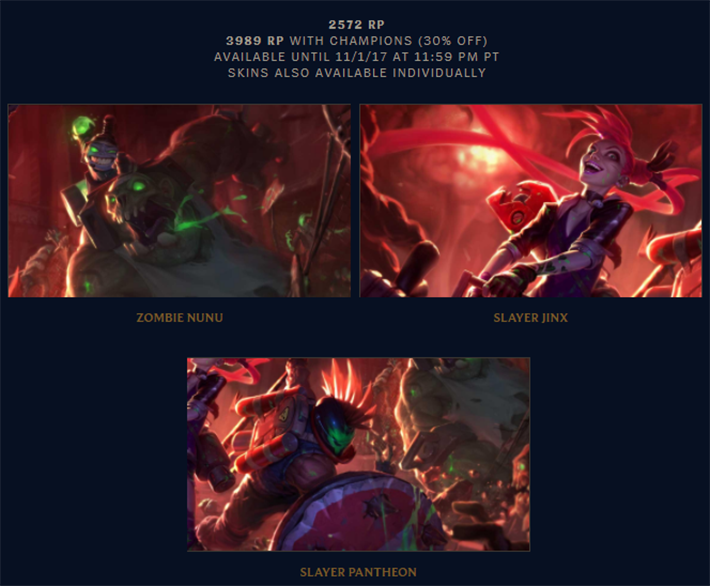 2092 RP for all bundle without champions, and 3996 RP for skins with champions. Fearsome Foursome Bundle is available until 1st November 2017. Five awesome skins for 3410 RP, or 5849 RP (champions included + 30% off). Spooky Squad Bundle is available until 1st November 2017. For this bundle, you’ll need to pay 2572 RP, or 3923 RP if you also want to obtain champions. Underworld Bundle is available until 1st November 2017. For three skins with champions, you will need to pay 3989 RP, or 2572 RP if you want only skins themselves. Zombie Slayer Bundle is available until 1st November 2017. 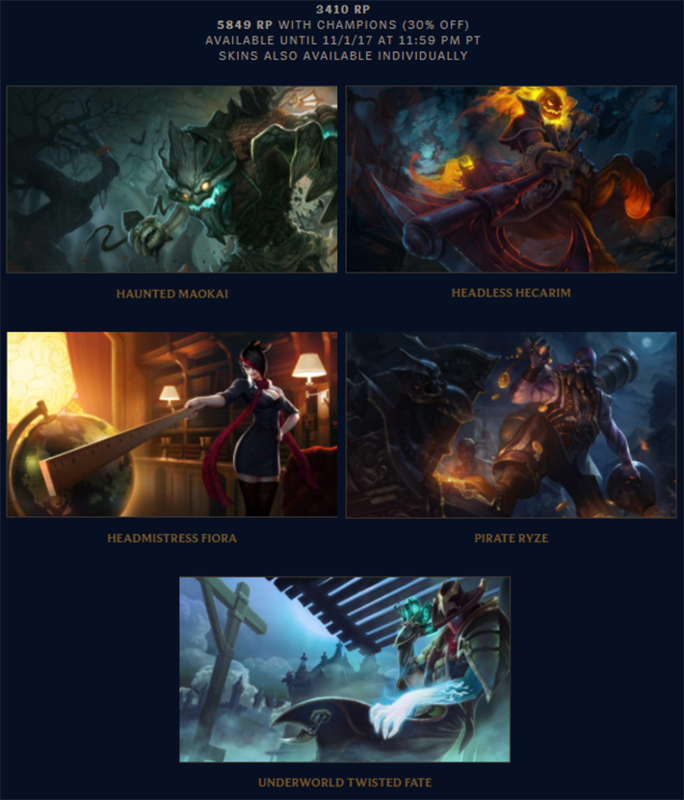 Three champion skins for 2572 RP (without champions), or 3989 RP (with champions). 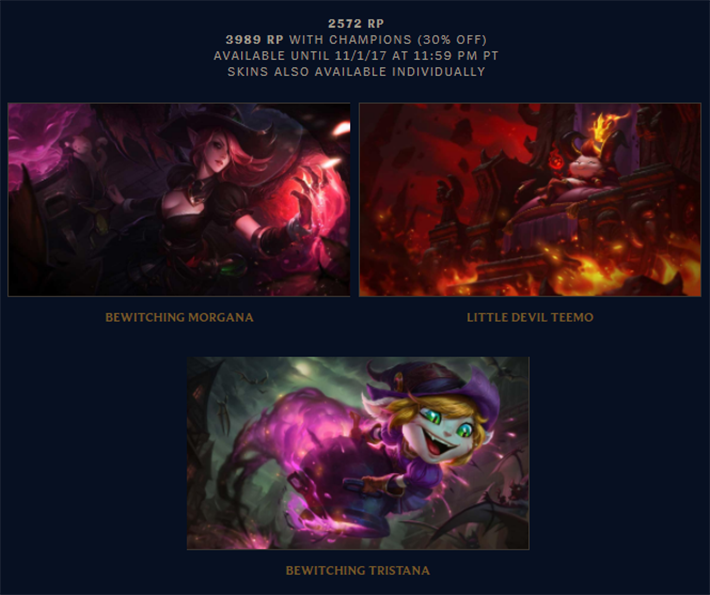 The Teemoing Bundle is available until 1st November 2017. The eight chroma variations of the Headmistress Fiora skin for 2295 RP, or 3175 RP with the Fiora herself, as a playable champion. 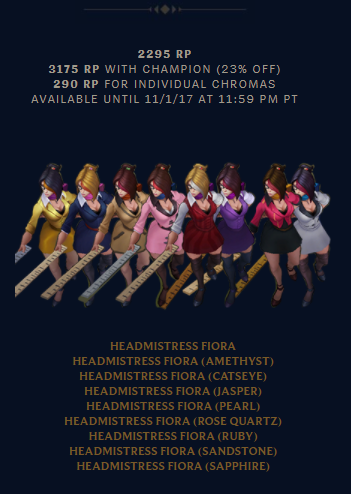 Headmistress Fiora Chroma Bundle is available until 1st November 2017. All three new Death Sworn Skins are available for 4575 RP, or for 5897 RP with champions (50% off). Death Sworn set is available until 1st November 2017. Next skins will be thrown into the Legacy vault on 01.11.2017, so grab them with 50% off while you still can. This year, a spiritual theme was chosen for the champion skins, in which cold blue colors predominate. Only three heroes have received new costumes, so let’s look at them particularly. This skin fundamentally departs from the Viktor’s main theme – Artifical Evolution (that is well represented in the Battlecast skins), turning him from a crazy scientist, into a dark warlock. 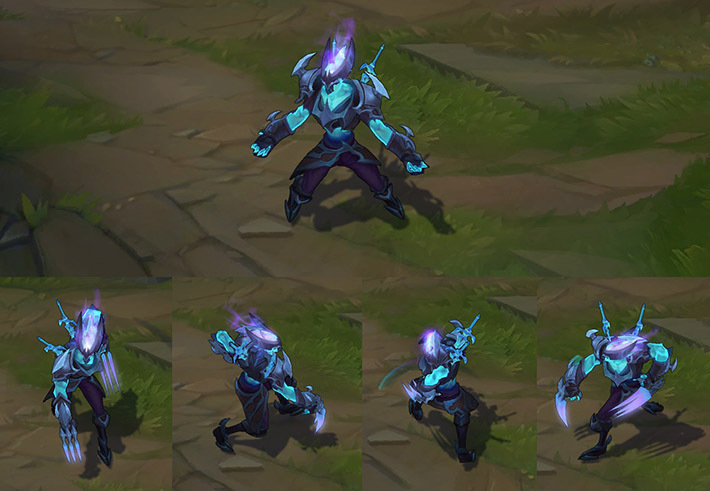 Death Sworn Viktor is dressed in dark armor, and from the champion comes a cold blue glow, which emphasizes his status of the Death Sworn. The third hand is now not mechanical but astral, and this innovation looks amazing. First impressions I have are strictly positive, because this skin does what it should, changes the feeling of the game for this champion. Because of this dark, otherworldly theme, we got pretty dark colors overall, but it does not spoil the whole picture. New Particle Effects are made interesting and follow a common style. For example, auto attacks, Siphon Power and Death Ray look similar to the classic versions, but they have a different nature. In general, this can be said about all the visual changes of this skin – very similar to classical, but with the different colors and a spectral glow. Only Gravity Field now has a magic circle in the center, similar to what we see on the official splash art. It is a pity that the work of designers is visible only in this ability because the rest could be changed much more significantly. So, let’s talk about new animations – I want to highlight new movements of the third hand, which are now much smoother and now this hand really seems ghostly. The new Recall animation is perfectly fit the whole spirit of the Death Sworn skins. Death Sworn Viktor creates a magical sigil under himself, and charging it with his staff, and shortly after he teleports back to the base. Sound effects are executed quite dual to me. On the one hand, they sound pleasant and differ from each other. But the problem is that they sound too high technologically. Where did all the mysticism go? The only thing I managed to hear is the quiet howls added to the sound effects. In my opinion, these sounds do not sound ominous enough. 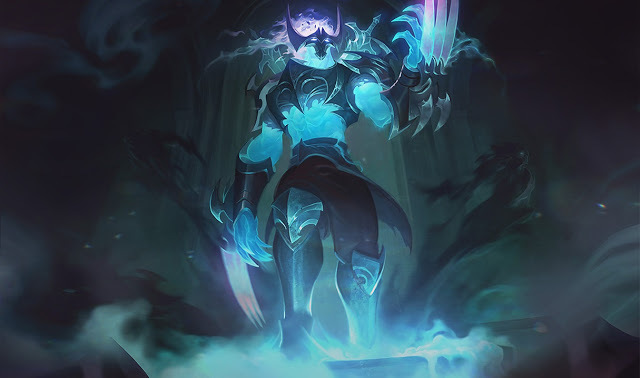 Summing up all this, I can say that Death Sworn Viktor is a quite interesting skin, that lack of the detailed sound effects, and pretty weak visual effects. But still, it is pretty solid skin, and I will recommend it to all players that love spiritualism-based themes. 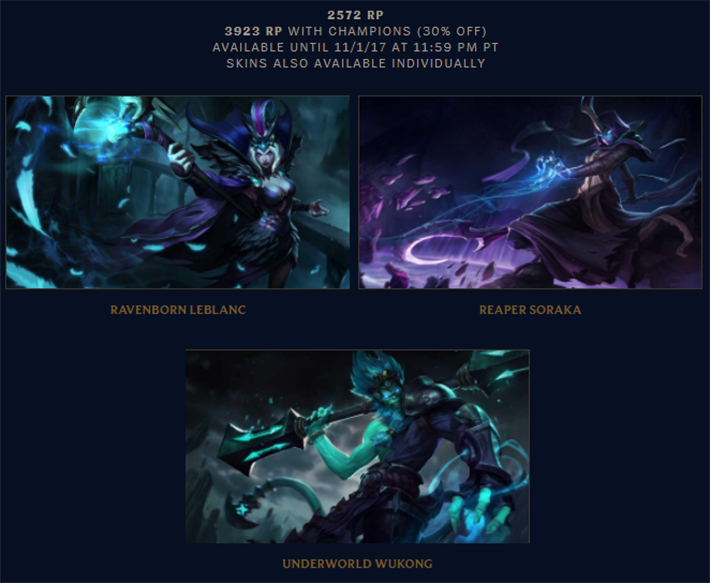 You can buy Death Sworn Viktor skin for 1350 RP in the LoL in-game store. 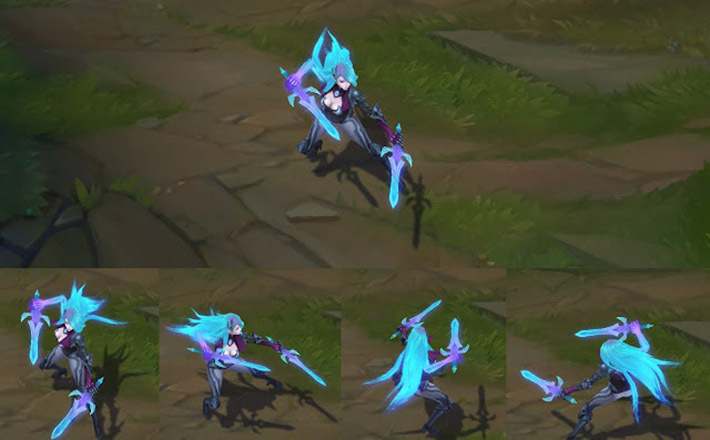 Death Sworn Katarina promised to be an ambitious skin, but all my expectations were crushed when I saw her in-game model. 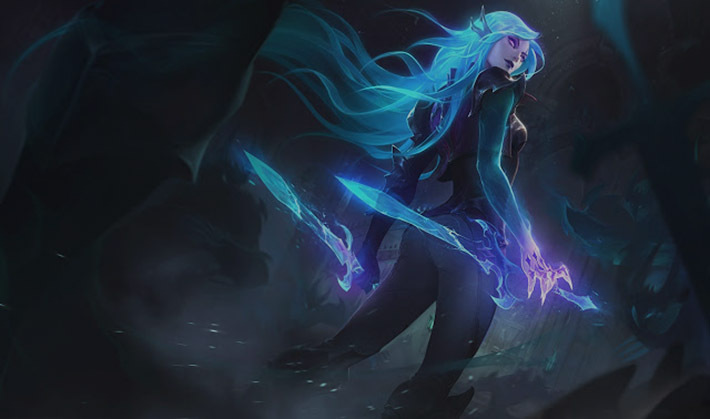 On the one hand, she looks great on splash art. Astral neon-blue hair, ghostly hand, and astral blades. The color palette is also chosen with knowledge, and the eyes burning with purple fire stand out well against the general background. What did we get in the game? Neon warrior, who does not have even a bit of mysticism – Hair, blades, and hand were supposed to be translucent so that it was immediately clear about the otherworldly origin of the champion, but the magnificent idea in the splash art in the game did not find its place. This skin is much closer to the Project line than to Death Sworn ones. Although I must admit that if you do not care about the origin of the skin, it looks at least interesting. The colors are excellent contrast and together give an interesting look to the Death Sworn Katarina. But even then, her blades do not look dangerous enough. Visual effects repeat all the same mistakes that I have discussed above. All abilities seem to be just recolors of the classic ones, although they look beautiful in the new color scheme. 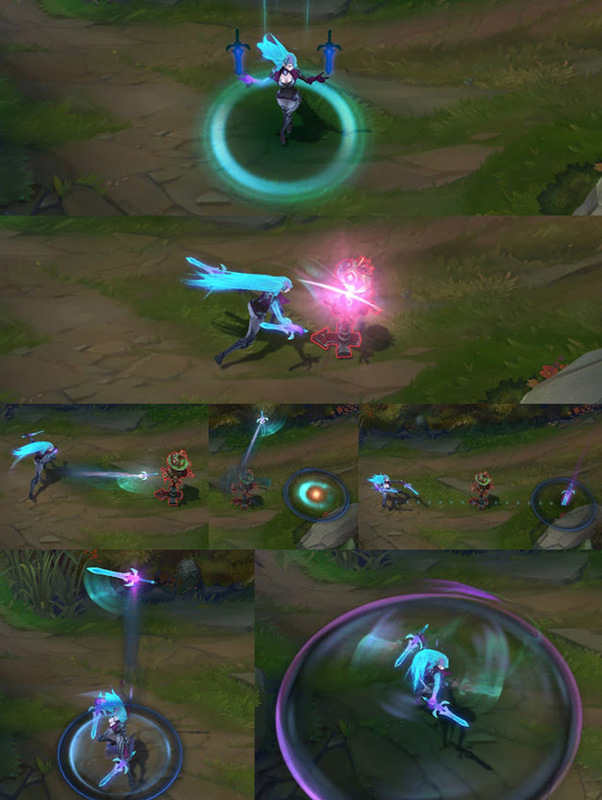 Although there are positive sides in the particle effects, when Death Sworn Katarina moves, she leaves a bluish trace, the same applies to her swords, with each attack of the champion. New animation of the recall is the only thing that references to the spooky part of this skin. 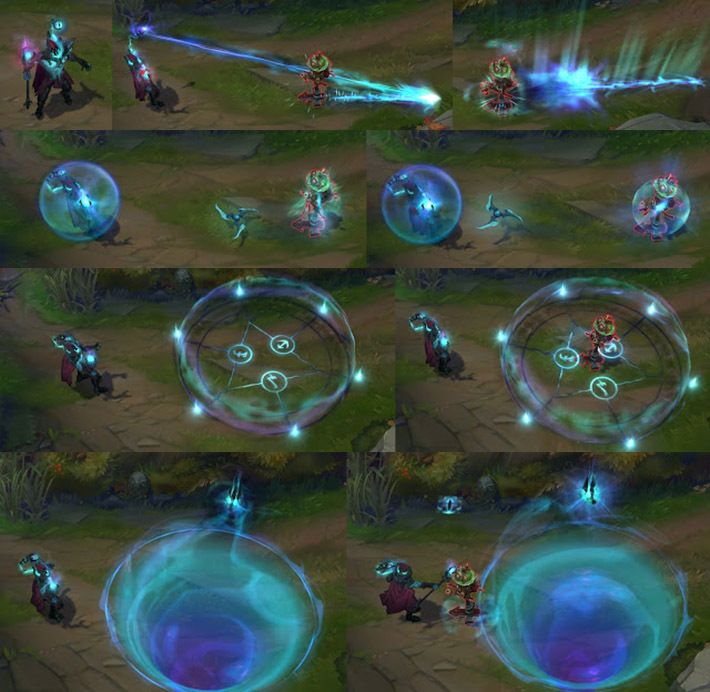 Death Sworn Katarina opens a breach to the other dimension and then use it to travel right to the base. This time, I am completely satisfied with the sound. A metallic ringing with a light otherworldly howl, this is exactly what I expected to hear from this line of skins. The only thing I regret, that they do not use filters to turn her replicas into more ghostly form. Let’s sum up: If you wanted to receive the otherworldly mystic skin on Katarina, then you can safely ignore this Death Sworn skin. But if you like bright neon colors, then Death Sworn Katarina is the skin you may like. You can buy Death Sworn Katarina skin for 1350 RP in the LoL in-game store. Death Sworn Zed is presented in the form of a paranormal fighter who glows from the energy that overwhelms him. An excellent idea of designers again could not find a realization in the game. On splash art, we face a truly formidable killer who has not belonged to this world anymore. Violet-Blue combination of colors looks great in the picture, but in the game, they could not convey the same effect. It was decided to mostly abandon the ghostly glow of the claws and the head, for some reason, and the appearance of the champion was badly damaged, and before us again appeared a strange kind of ninja with an unusually blue skin. 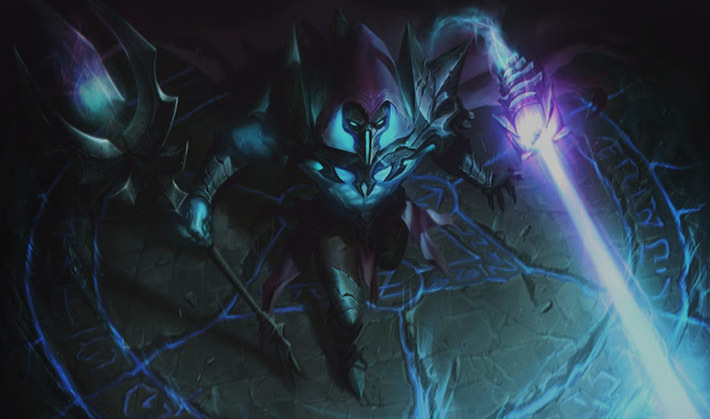 Perhaps designers should choose a quite darker color scheme for this champion because Zed is known as a living shadow, and with such a vivid appearance so it will be difficult to call him so further. Visual effects are better than previous representatives of this series have. 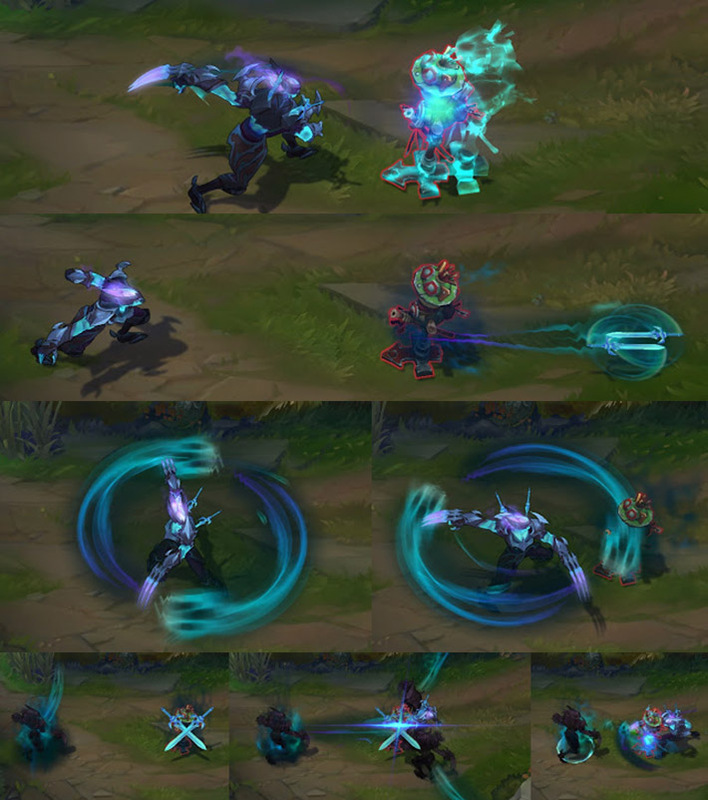 Particle effects at the same time look very nice and repeat the color scheme of the champion. When attacking the enemy, it seems that he is knocking out a piece of the soul from the enemy. Using the Shadow Slash ability, Death Sworn Zed calls two spirits that make a turn around the hero and it looks impressive. Sound effects are wonderful, quiet but at the same time, sonorous notes evoke the right emotions in me. Although the voice of the champion himself makes the blood to shiver in the veins, still he lacks some otherworldly effect. 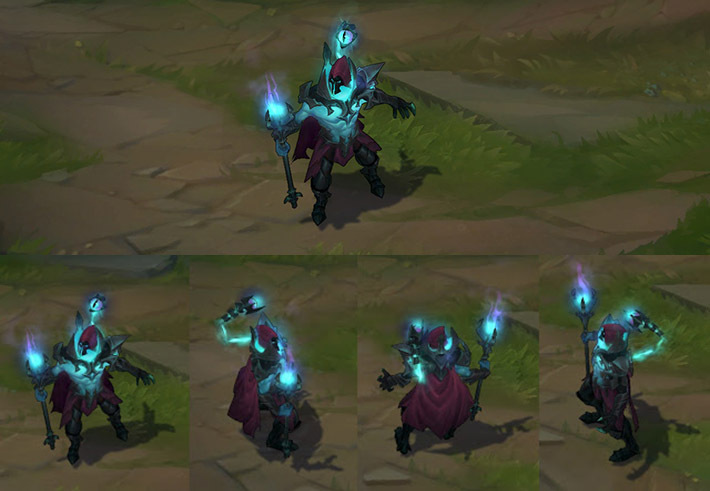 Death Sworn Zed skin have a quite weak visual part, his appearance is very controversial, but the sound and visual effects are executed perfectly. If you like the look of the champion, then I strongly recommend this skin to purchase. 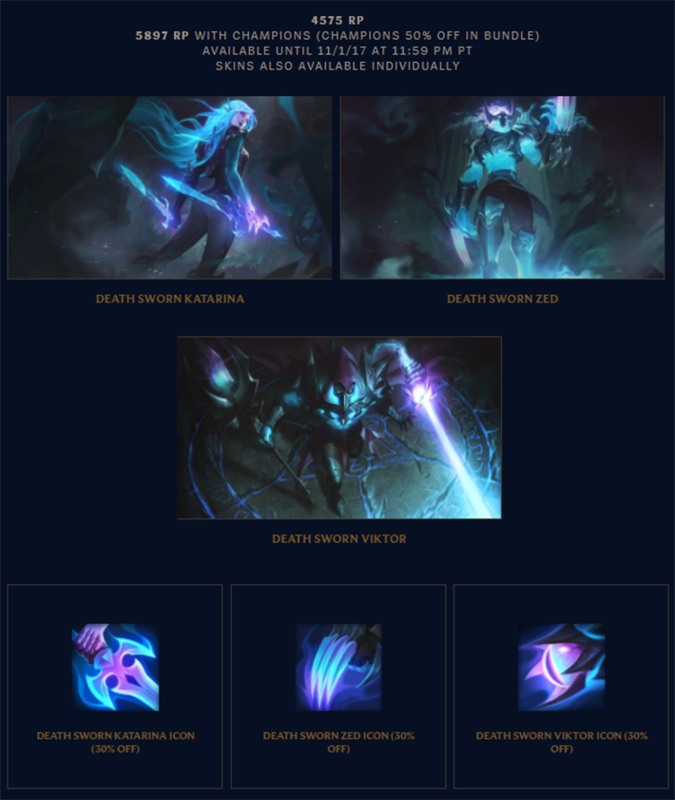 You can buy Death Sworn Zed skin for 1350 RP in the LoL in-game store. Halloween event in League is my favorite one so far. Nice artcile, want to find a list with all these legacy skins.